Theres a deadly menace somewhere in Empire City, and The Fixer only has until dawn to save his town - and civilization as we know it! Legendary Comics presents an all-out, head-busting, bone-breaking, neck-snapping brawl of a tale from Frank Miller, one of the most celebrated storytellers of the medium. 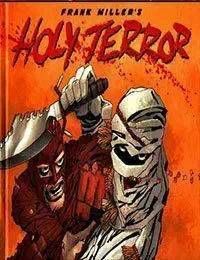 Years in the making, HOLY TERROR features the desperate and brutal quest of a hero as he is forced to run down an army of murderous zealots in order to stop a crime against humanity.